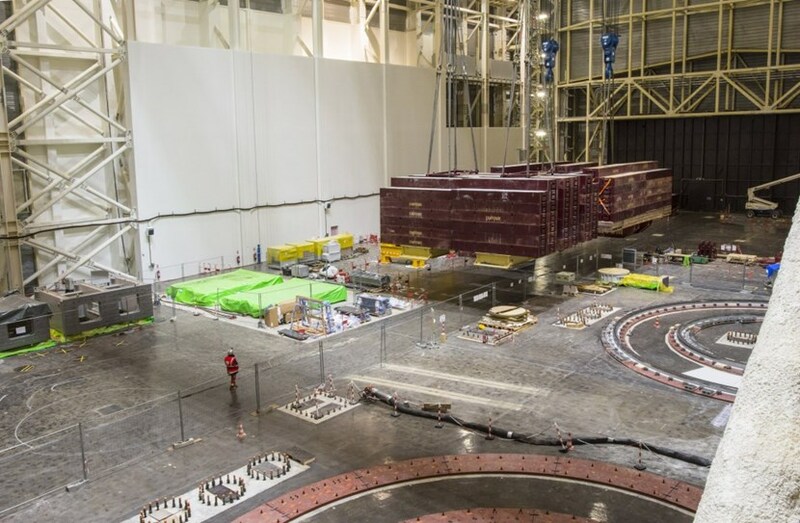 It's almost midnight and everything is still on the ITER worksite. Everything? Not quite. In the Assembly Hall, a small group of people are craning their necks to carefully monitor the nearly imperceptible movements of a large mass of steel suspended some 50 metres above the floor. High in the rafters, the trolley's electrical motors are pulling with all their strength at the cables holding the dummy load, 10 percent heavier than the nominal lifting capacity (1,500 tonnes) of the massive double overhead crane. The date is 18 December and this is the second-to-last of the "load tests" for the main cranes in the Assembly Hall. A few days earlier, in order to prove the resistance of the crane's structural elements, the slings had been put into tension with an even heavier load (1,875 tonnes). These "static" tests had confirmed that the double overhead crane could withstand, without difficulty, a load 25 percent heavier than the nominal lifting capacity of 1,500 tonnes. 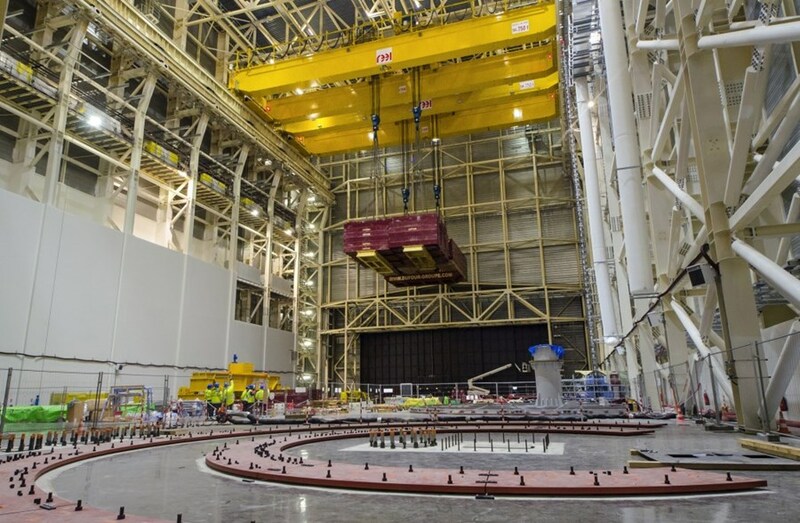 Now, with a load 10 percent heavier than nominal, the crane system is being tested "dynamically," performing all the movements that will be required for the handling of the actual machine components. What needs to be observed and measured this time is the building's "behaviour." Dynamic tests cover all the movements that will be required for the handling of the actual machine components. What they aim to measure are the transient millimetric deformations of the building's steel structure. As the load slowly moves along the width of the Assembly Hall—and then along its length—the building's structure is submitted to considerable forces, causing the steel pillars of its frame to compress and flex. The building is designed to accommodate these transient millimetric deformations that laser measurements closely monitor. "The steel structure is elastic," explains a surveyor from the architect-engineer Engage. "We know precisely, from computer models, what the expected values are. We're just making sure that what we are observing tonight remains within the anticipated numbers." One last test needs to be performed before the crane system can be fully commissioned. Called the "DCHLB test," for Dual Crane Heavy Lifting Beam, it will consist in attaching the four crane hooks to a single connection point in the form of a massive clevis. Such a configuration is required to interface with the dedicated tools that will lift vacuum vessel sectors and the central solenoid. Load tests are performed at night, when no activity is ongoing in the Assembly Hall. 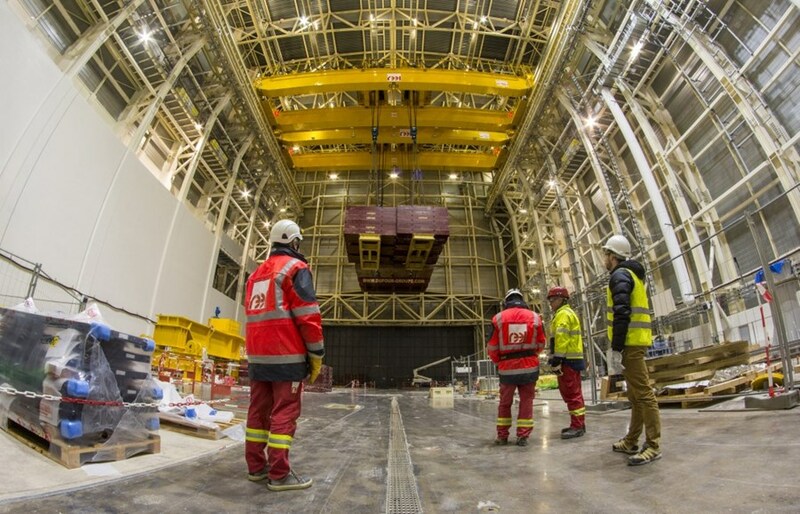 Participants include specialists from the crane manufacturer Reel, the ITER Organization, the architect-engineer Engage and the safety controller Bureau Veritas. In about a year, the crane system in the Assembly Hall will begin handling actual machine components—massive steel pieces (or pre-assemblies) that will be delicately moved and deposited inside the "well" formed by the bioshield to be assembled and integrated. Like a giant hand performing a watchmaker's job.